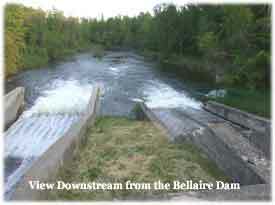 Antrim County owns two dams: the Elk Rapids Hydroelectric Dam and the Bellaire Dam. The County is also obligated by court order to maintain the water levels on the two lakes formed by the dams: Elk Lake and Intermediate Lake. The County Board of Commissioners assigned the task of operating the dams and maintaining the water levels to the Operator of Dams. The Dams Department is overseen by the Buildings, Lands & Infrastructure Committee of the County Board of Commissioners. The Operator of Dams operates the Bellaire Dam himself. (The Bellaire Dam is located in Richardi Park, near the swimming beach and picnic area.) The dam consists of an earthen berm with 5 electrically powered gates set into a concrete structure. The gates must be operated on site to increase and decrease the flow of water from Intermediate Lake in order to maintain the court ordered lake level. The level is measured by a gauge located near Central Lake. 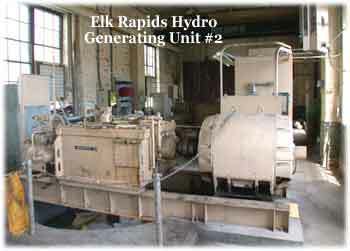 The Elk Rapids Hydroelectric Dam is operated under contract by Elk Rapids Hydroelectric LLC (ERH). This dam maintains the court ordered level for Elk Lake. The Operator of Dams acts as supervisor of the contract and as County liaison with ERH. Since the facility is County property, the Operator of Dams is also responsible for community relations, periodic maintenance, and regulatory responsibilities of the Elk Rapids Dam building and the equipment. Both dams require routine safety inspections by the Department of Environmental Quality, and in the case of the Hydro Dam, the Federal Energy Regulatory Commission (FERC). The inspection process necessitates the hiring of engineers and often the bidding of contracts for larger maintenance projects, which is handled by the Operator of Dams and authorized by the County Board. In addition, the Operator of Dams is the principal responder to emergencies at the dams and responsible for coordinating with other agencies. The Operator of Dams is the sole employee of the Dams Department, but gets secretarial support from the County Planner’s office. Each year, the Operator of Dams provides an Annual Report to the County Board. He also maintains a small office on the first floor of the County Building. The position is part time only and most of the work is performed at the dams. The Department of Dams was created in 2012. Mark Stone currently serves as Operator of Dams. As noted above, the Bellaire Dam is located in Richardi Park, near the swimming beach and picnic area. The original dam was constructed soon after the first settlers arrived in the area to power the local sawmill and back up Intermediate Lake to make it easier to float logs from the adjacent areas. Richardi, the park’s namesake, was the owner of the woodenware factory that was located on the site of the park and the man responsible for first fitting the dam with equipment to generate electricity. Ironically, at first the power was not used in Bellaire, but a transmission line carried the electricity to Charlevoix where it was used to provide some of the first public lighting with electric bulbs (reputedly the first such use of electricity in Michigan). The Bellaire Dam continued to generate power well into the last century and was finally decommissioned some time in the 1950s. The three concrete chutes with vertical gates on the west side of the dam date to the era of power generation, during which they served as the overflow gates in case of floods. The two radial arm gates and their concrete chutes were installed around 1980 and replaced the structure that housed the water turbine and generators. The summertime water level of Intermediate Lake was established by a circuit court order at 607.15 feet above sea level in 1986. On November 1st of each year, the order calls for the level to be dropped to 606.54. The following spring, the lake level is raised to the summertime level on May 15th (or ice break-up, if it occurs earlier). The legal lake level has changed several times in recent decades. In 1973, the court had established the Intermediate Lake level at 607.4 (3 inches higher than presently) in the summer and 606.94 (six inches higher) in the winter. In 1980, the County Board of Commissioners petitioned the court to drop the level due to complaints about erosion and flooding. In 1984, after the petition of the Upper Chain of Lakes Association supporting the Commissioners, the court ordered an average year round level of 606.54. However, problems with summer boat navigation in low water initiated a counter argument and petition in 1985 by the Northern Waterways Association. The court responded by setting the higher level of 607.15 during the summer. In practice, the water level have a fluctuation of several inches with a significant rain or melt—even if the dam is wide open. Steep hills in the Intermediate Lake watershed send water into the lakes very quickly and cause sudden increases in the lake level. If the ground is already saturated with moisture, the runoff accelerates—as it will with the quick melt of snow pack during a spring heat wave. The stretch of distance from Intermediate Lake down the shallow Intermediate River to the dam and the convergence with the Cedar River delay the movement of water from the lake—and the effects of changes of gates at the dam. Just this spring, heavy rainfalls drove the lake level five inches above normal and it took almost two weeks to drop back—even though all the dam gates were open since the rains began. However, most of the time the level is within an inch or so of the ordered level. One thing is almost always true: the water level is either going up or going down—it’s rarely remains static for more than a couple days at a time—but that’s just Michigan weather at work. Similar to the Bellaire Dam, the first dam at Elk Rapids was built with the arrival of the first settlers and also powered the local sawmill. Sometime in the late 19th century, the dam was electrified to supply the growing iron foundry and related industries. The Elk Rapids Iron Company conveyed the dam to the Elk Electric Company in the mid 1920s and it later came into the ownership of Consumers Power Co. The dam was decommissioned in the late 1950s and eventually came into the possession of Antrim County. During the energy crisis of the late 1970s, the County took the opportunity to recommission the facility as a hydroelectric dam, and the current generating equipment was installed at that time. Concurrent with the recommissioning, Antrim County contracted with Traverse City Light and Power to manage the daily operation of the electricity generation. 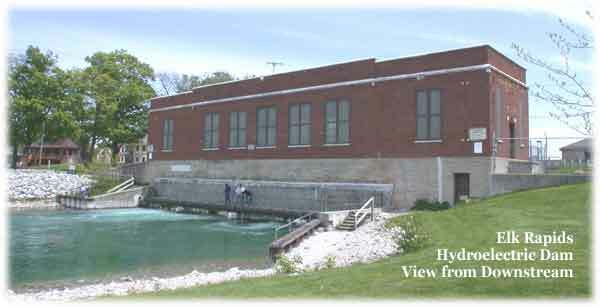 In 2007, Antrim County contracted with a new group, Elk Rapids Hydroelectric LLC (ERH), to operate the hydroelectric facility. 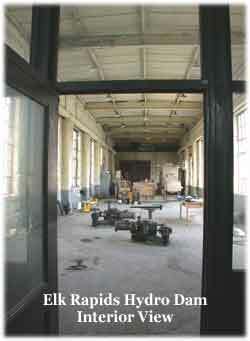 ERH is a family-owned enterprise (the Stockhausens) who are dedicated to the relicensing and perpetuation of hydro power in Elk Rapids. Antrim County is now halfway through the five-year licensing process with good prospects for success. Thanks to the dedication of the Stockhausens, the facility is now running in the black. The present day dam is located on Dexter Street in Elk Rapids, situated between the upper (Elk Lake) and lower (Grand Traverse Bay) boat harbors and is an integral part of the historic downtown and the recreational waterfront, including the Edward R. Grace Harbor. The downstream side of the dam is a popular fishing destination that attracts anglers from all over Michigan. The brick building visible from the exterior houses the generating equipment. Built into its foundation are four separate chutes through which the water flows. Only two contain generating turbines. The water enters a chute through gates on the upper side and flows into a large rectangular chamber. A cylindrical turbine housing sits in the middle of the chamber with wicket gates at the top edge. Water flows through the wicket gates and falls downward into the housing, pushing the turbine blades as it falls. The turbine drives a shaft that extends through the upper floor and drives the electric generator. All the generating equipment is monitored 24 hours a day. The summertime water level of Elk Lake was established by a circuit court order at 590.8 feet above sea level in 1973. On November 1st of each year, the order calls for the level to be dropped to 590.2. The following spring, the lake level is raised to the summertime level on April 15th (or ice break-up, if it occurs earlier). For several reasons, the Elk Lake level is easier to keep constant and less fluctuations occur than on Intermediate Lake. The Elk Rapids Dam has considerable capacity and is located close to Elk Lake, so more water can be moved more quickly in response to rainfall. Also, the Elk River runs into Grand Traverse Bay through another route and provides an overflow capacity independent of the dam. This page last updated on 1/4/2019.